The larvae of this species are usually, attended by ants from at least six genera. Chief food plants are native and introduced legumes in the family Fabaceae. Mature larvae yellow-green with reddish line, row of black spots and a pale green line on each segment, hairs present, humped: head dark brown. 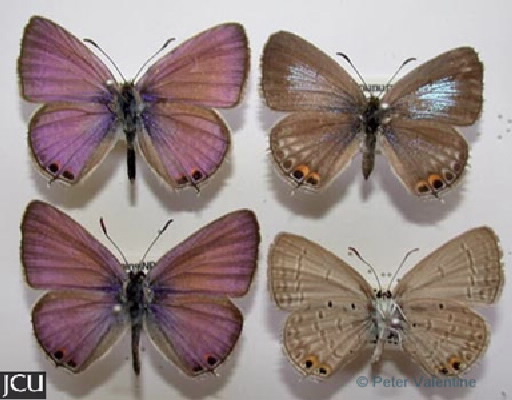 Adult male pale lilac with a bluish basal area, brown outer margin, hind has two black spots near the short slender tail; female pale brown with a bluish centre, some whitish subterminal rings and two black spots near the tail; lower surface grey-brown with black brown spots and bands edged in white, black spots in margin adjacent to tail.